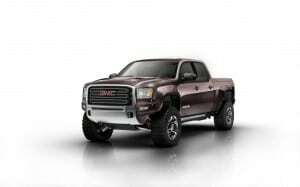 GMC Sierra All Terrain HD Concept - AutoNetTV Media, Inc. Looking to slot in between the Ford Raptor and the Ram Power Wagon, the GMC Sierra All Terrain HD Concept has a strong blend of high-speed off-road running and rock crawling ability. Check out the specs of this very impressive truck. Do you know the benefits of keeping your tire pressure monitoring system working?